We really liked this hostel and intend to go back. The staff were amazingly helpful and friendly. I could cook my own meals and we chilled out in the bar. The location was great for central Tana. Only negatives the shower in the 2nd room was very weak (but still hot) and the couple upstairs were very heavy footed. This is a great hostel. Very helpful receptionists. This is an excellent hostel in a central location. The staff is beyond helpful. They have an on sight bar and serve Mexican food that is quite good. If you stay and are planning to do some sightseeing ask the staff to contact Leva, he is an excellent guide and driver who can set up anything you want to do. Both the hostel and Leva are very reasonably priced. One tip.. using Google maps for the area doesn't work well, as alot of the smaller streets are not visible. Ask the staff or Leva. Fantastic hostel. Safer area of Antananarivo, helpful staff, clean rooms, and good atmosphere. Would definitely stay here again. 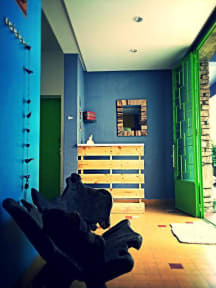 This hostel is for Flashpackers, not Backpackers! There are cheaper places to stay in Tana but, this is the nicest area/street. Food and drink are overpriced but, more traditional local options are a short walk away, if you're able to do so before sunset or happy to travel for dinner/drinks at night. Staff are all fantastic, if over-worked (only one staff member on duty, except Fridays) and concerned for your welfare in a city with a deservedly edgy reputation. Local beggars congregate here.